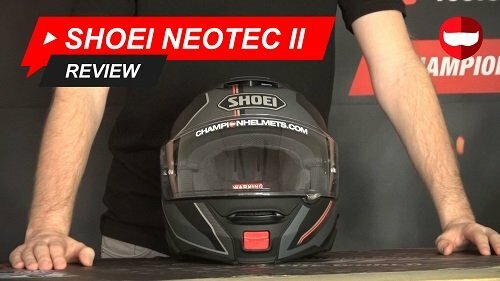 Our review of the Shoei Neotec II, now in text! So the Shoei Neotec is perhaps my favourite modular helmet and there are plenty of reasons why. Despite my preference, this review will remain unbiased and we will stick mostly to the facts. Shoei made some big waves with the original Neotec and spent some years improving upon that original helmet. The result was the Neotec II and I will go more into the differences between the original Neotec and the Neotec II in another film. So the Neotec II has 2 competitors; the Schuberth C4 Pro and the AGV Sportmodular. These 3 helmets represent the 3 best modular helmets on the market today. This helmet is definitely one of the best and as such, is priced as one of the most expensive. At a 699 USD recommended retail price, the Neotec II is not an entry level helmet. If I was to summarise this helmet in 1 word, it would be quality. Shoei is a brand with a heavy focus upon quality which is immediately noticeable here. This quality starts with the shell which is made using their Advanced Integrated Matrix and this is a method of working the fiberglass composite material precisely into the shell. What this does is reduce weight from unneeded material and strengthen areas of importance. Speaking of weight, that is the Neotecs Achilles heel. This helmet will weigh about 1700 or 1750 grams which is quite heavy. This rivals the Schuberth C4 Pro and is way heavier than the AGV Sportmodulars 1300 grams. This high weight has however come from the design and purpose of the neotec II. Modular helmets are always going to be on the heavier side but the Neotec II has used those extra grams to increase the comfort of the helmet. I ‘ll explain that a little more later on. Aerodynamically, this helmet is very well made. We have these ridges here, channels here and a lip at the back. What this means is that the helmet glides through the air and this seems to help reduce the weight at speed, plus it has the effect of reducing the overall drag of the helmet. This is an example of the helmets high quality and comfort. Sticking with the outside of the helmet the ventilation is controlled by these 2 vents, one on the chin and one on the brow. The one on the chin bar is a simple open and close mechanism but the top one can be set to 1 of 3 positions. At the back, the hot air escapes via 2 vents which are always open. The ventilation is what you would expect from such a high quality helmet. Now the visor of the Neotec II is pretty interesting. It is a standard high end visor, it is pinlock prepared and the pinlock lens is provided with the helmet. What is interesting though is the visor mechanism because it seals the visor into the helmet. It uses this spring here to adjust the position of the visor and push it into place when the visor is closed. It can also be opened into 1 of 7 positions from cracked to open. The middle settings are relatively strong but may blow open at speed. There is also a drop down sunvisor and it is controlled by a slider on the side. The sunvisor is rated to provide almost the same protection as sunglasses, so it offers great sun protection and visibility in highly lit environments. Inside we have again, the kind of liner you would expect from a high quality helmet. The liner is removable, washable and overall it is nice and comfortable. It strikes a good line between warmth and coolness and stays pretty fresh, pretty well. The liner, like everything on this helmet has a quality feel to it. Shoei has multiple cheek pad sizes which can be bought separately to customize the fit of your helmet too. The liner has been used to really cut down on noise, which is typically caused by wind and this is helped by the close fit of the liner and cheek pads. The cheek pads and the neck roll got some upgrades to really help cut down on noise plus we have a chin wind guard and thin material around the chins straps to minimise the amount of wind and noise that can get into the helmet. They managed this by using a windtunnel to test the helmet. This really shows with the aerodynamic look and the reduced noise that gets into the helmet. What that means is that this is one of the quietest helmets around. It is so quiet that I cannot tell the difference between this the Scuberth C4 Pro or the AGV Sportmodular. There is something quite controversial on this helmet though. The integrated communications system. So Shoei made a deal with Sena to make the Neotec II and the Sena SRL 1 especially to fit each other. So if you have a Sena SRL 1 or want to have one, this is great news. You can really easily slot the com system into these ports here and the liner has been made to accommodate that system. The bad news is that you cannot, as easily, add another system. It is possible but it will need to sit higher up on the shell of the helmet which some people weren’t super happy with. That being said, Sena is a great communication system brand and people generally disliked being pushed towards a particular system but had no problems Sena . Sena systems though are generally a little expensive so to help you out, we offer a discount at championhelmets.com when you buy the Sena system with the Neotec II in a bundle, and you can get that via a link in the description. Those are the features of the helmet and all that so lets talk just a little more generally about the helmet and where it fits. The Neotec II is one of the top 3 modular helmets and while the AGV Sportmodular is a more sporty helmet, the Neotec and the Schuberth C4 Pro are both more orientated to cruising, touring and comfort. The Schuberth C4 Pro is then the biggest competition to the Neotec II and there is little to separate these helmets. Basically they are quiet, comfortable and luxurious modular helmets. The Neotec II is simply different to the C4 PRO but they fill their roles well. Like I mentioned the Neotec II is a touring helmet so it has been designed as a comfortable helmet which someone who rides a longer distance could really appreciate. 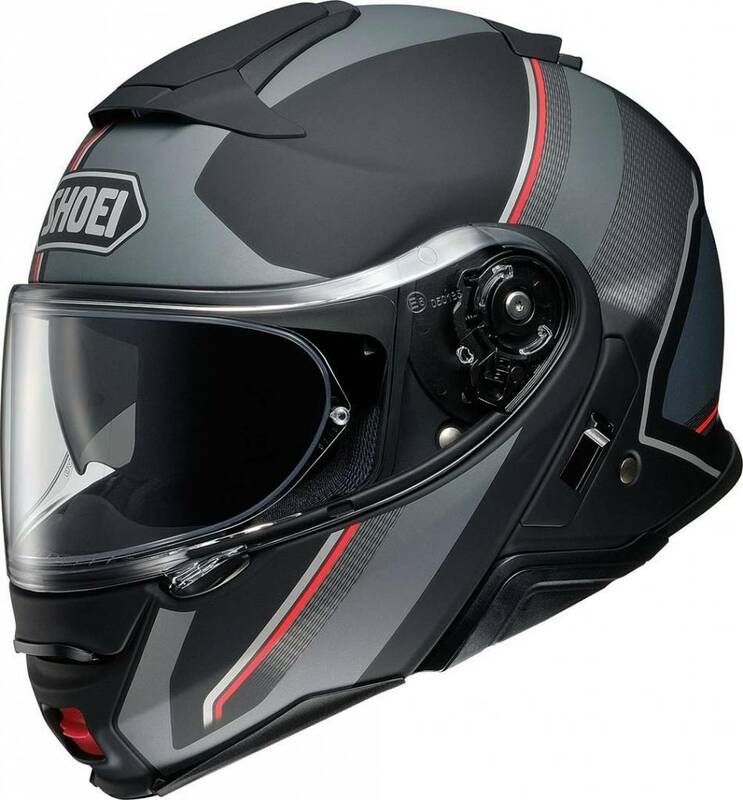 The Shoei Neotec II is also a helmet that will flip up only to the brow, though that is normal and in this position it will cause drag so I recommend not travelling at speed with the chin bar up. Everything that Shoei has tried to do with this helmet they have done well and they have injected their brands quality throughout the helmet. The only downsides are the weight, which will be a personal thing and the Sena system preference which may also annoy some people.